There was a time when this match-up was THE MATCH-UP. There was a point in time where this game would’ve gotten TNT Thursday night love or first available Sunday after football on ABC billing. Such is the power of LeBron James. With James taking his talents to Northeast Ohio, this game has been mitigated to NBATV exclusivity on the same day the President will be giving his State of the Union address. In other words, don’t expect a 4.9 viewership rating for this game. The Thunder finally have a bit of a rhythm going to their game. They’ve won 2 of 3 since their five day break and have scored 127 points (non-overtime) in consecutive games. They beat the best team in the league and then molly-whooped a lottery team on their own floor. Though the sample size is small, the team seems to found a comfort zone with Dion Waiters that is paying instant dividends. The Waiters-Reggie Jackson combo is keeping the pressure on teams, even when Kevin Durant and Russell Westbrook are off the floor. Another plus during the Thunder’s recent play has been Serge Ibaka’s play. He’s doing a much better job of mixing his inside and outside presence whenever the team needs it. In the Warriors game, Ibaka shredded Golden State in the 4th quarter, scoring 10 consecutive points on 4 shots (2 lay-ups, 1 dunk, and a 3-pointer), which were all assisted by Westbrook. Then, against Orlando, with the lane opening up like the Red Sea for the Thunder’s playmakers, Ibaka stepped to the outside and thrashed the Magic with four 3-pointers. This is the first of 2 meetings this season between these two teams. These teams split their meetings last season, with each team winning on the other’s home floor. The Miami Heat currently stand at 18-22, good for 7th in the Eastern Conference. They are bottom third in most statistical categories. They are the slowest team in the league (30th in pace), which helps their scoring defense out, allowing only 97.2 points per game. Unfortunately, they only score about 93.5 points per game. The departure of LeBron James has changed the way Miami plays, and they are still adjusting to life without him. Mario Chalmers still leads the current Miami attack, but is likely not getting yelled at as much. 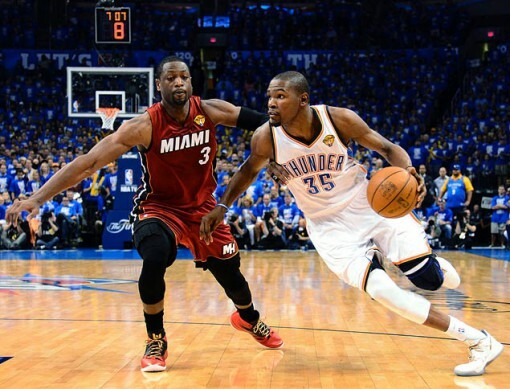 Dwayne Wade is leading the team in scoring, at 22.1 points per game, and in assists, at 5.6 per game. When Wade has been out, rookie Shabazz Napier has stepped in. Luol Deng is still one of the premier 3 and D guys in the NBA and has been a good fit for the Heat. Up front, Chris Bosh is still one of the better inside/outside big men in the league, averaging 21.6 points on 40.5% shooting from 3-point territory. Up front, Most Improved Player candidate Hassan Whiteside has been one of the more pleasant surprises in the NBA. Whiteside’s journey has seen him go from Sacramento to Lebanon to China to the D-League, and then to Miami where he seems to have finally gotten his professional footing. Off the bench, Miami has a couple veteran players (Udonis Haslem, Danny Granger, Chris Andersen, Norris Cole), but lacks a consistent scorer. * – Dwayne Wade is questionable due to a hamstring issue and Luol Deng is questionable due to illness. 1. 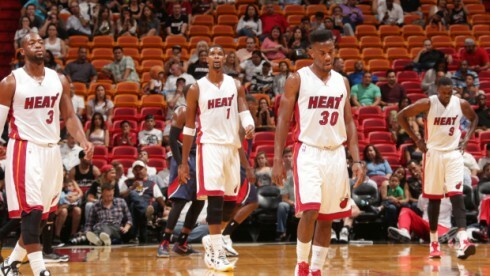 Pace – The Heat play at the slowest pace in the league. The Thunder, when healthy, like to move the ball up the court as quickly as possible. 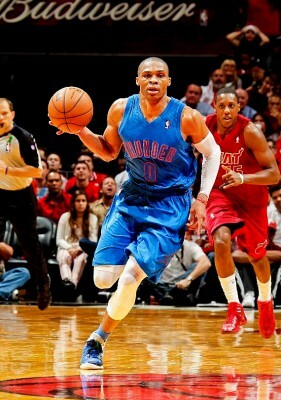 It would behoove the Thunder to play their brand of basketball. 2. Bench – The Heat have one of the weaker benches in the league. With Wade and Deng a possibility to miss the game due to various ailments, the Thunder reserves can be the key to an easy Thunder victory. 3. Half-way Point – This is the 41st game of the season a.k.a the half-way point. It will be up to the Thunder to see if they finally end up above .500 for the first time this season, or if they, once again, dip a game under .500.